At a time when The Beatles were headlining the British musical invasion of America perhaps the strongest response from across the pond came from the Motown label. Motown possessed the capability of producing hit after hit from its collection of artists and each recording featured a very tight rhythm section. Not surprising really as unbeknown to those listening in the UK at the time, the backing section was almost always down to a small group of musicians that became known as The Funk Brothers. Their work schedule was pretty demanding but after a day of sessions they could often be found still playing together in the local clubs at night so it's no wonder that they were an extremely well integrated unit with a sound and groove of their own. However, in the '60s there was no system for recording who did what on a session and it transpires that Motown were particularly poor record keepers. Even they are unsure of who played on what for their early sessions so it's not surprising that for some considerable time the world remained ignorant of the individuals responsible for making this phenomenal sound. One thing always evident in any Motown recording was the bass playing. This was relatively high in the mix so clearly audible and often quite complex in structure yet always 'in the pocket'. From 1962 to 1968 this was almost entirely down to the ultra-groovy playing of James Jamerson, although he worked for the label before that. Born in Charleston in January 1936 it was the move to Detroit with his mother that changed the life of this rather shy young man. He played a little piano as a child then studied acoustic bass whilst at high school. With heroes such as Ray Brown and Paul Chambers his first musical love was with the jazz he heard on the radio. Jamerson purchased a German upright bass and was soon a regular on the club circuit and playing sessions for the local recording studios. But it was his club work that brought him to the attention of a particular local record producer, Berry Gordy. In 1959 Gordy offered James regular work at his Hitsville USA studio, which was the home of the Motown record label. Here he became a member of the 'house' band and together they performed on the majority of the exceptionally large output of Motown recordings, or Tamla Motown as we knew it in the UK. Although he was still playing upright bass his style and attitude towards his work set him apart. Not content to just stay around the bottom end James would syncopate his notes and 'walk' his lines all over the neck in a Ray Brown fashion and for popular music this was a very different approach. Some of his earliest recordings whilst still playing double bass included Where Did Our Love Go by The Supremes, My Guy by Mary Wells and Heatwave by Martha And The Vandellas. In 1961 fellow bass player Horace 'Chili' Ruth persuaded Jamerson to try a Fender bass and although apparently reluctant at first, he soon found it good to work with. It also allowed him the opportunity to use ideas spawned from his knowledge of jazz that would have been difficult to pull off on upright bass. It's believed that the first Motown track he laid down using the Fender Precision was Strange I Know by The Marvelettes. Sadly it seems this first Fender was stolen so he bought a stock sunburst '62 Precision and like all standard Fenders at that time it came fitted with a pair of cover plates, a string mute (strip of rubber stuck beneath the top surface of the bridge cover) and flatwound strings. This combination of flatwounds and a damper meant that any natural sustain from the strings was totally removed so along with the short fat notes he plucked using his right index finger (nicknamed the hook) he began producing the sound we all love. As for general tone he relied on the natural sound of the instrument as both the tone and volume pots on the Precision were always wound flat out. James always used heavy gauge La Bella strings (the older the better) so it's not surprising that the bass developed a pretty awful action to a point where many deemed it unplayable yet Jamerson was unconcerned (probably thanks to his years playing upright bass) and reckoned it improved the tone. He was a tight yet expansive player and his P-bass soon earned the name of the funk machine. This was the bass he always used for recording, however he did own a Fender Bass V as well - this is a curious beast with an added high C as the fifth string - but whether he ever recorded with it or not is unclear. For sessions he would always plug straight into the desk but for club work he favoured an Ampeg B-15 Portaflex or when out on a Motown tour he'd use a Kustom 200 with a 2 x 15-inch cabinet to cope with the larger venues. This was actually quite an ugly looking thing as both head and cabinet were covered by blue Naugahyde, an artificial leather used mainly in automobiles. Jamerson was always well respected as a musician although the wages the session players received back then were certainly not representative of the essential part they played. Downtime continued to be spent in the blues and jazz clubs of Detroit playing, drinking or both as James certainly liked a drink or three. One of the most famous stories about him was featured in the 2002 film, Standing In The Shadows Of Motown which tells the story of The Funk Brothers. Apparently Marvin Gaye was desperate to have James' bass work on his track, What's Going On, but he wasn't there for the session. A quick scouring of the local bars found him somewhat worse for wear but they brought him back to the studio. However he was so drunk he couldn't stand and it is said that he played his part whilst lying on his back in the studio. He played a song he was unfamiliar with and the first take was the one they used! It's generally accepted that it was on another Marvin Gaye track, Pride And Joy that we hear the Jamerson style of playing as we truly know it for the first time. Fully aware of how good his bass parts were the producers left him pretty much to his own devices as far as his parts were concerned and he made full use of this freedom which allowed his unique style to evolve. By 1965 he was recognised as the funkiest and most melodic bass player around by turning in great performances on tracks like Stop! In The Name of Love for the Supremes (just one of many at this time) and I Can't Help Myself (Sugar Pie Honey Bunch) for The Four Tops. Then towards the end of that year he slipped into a higher gear and began playing as if he was on an equal footing to the featured artist. His playing had become more unpredictable than ever as is particularly evident on Reach Out, I'll Be There, again from The Four Tops and Reflections from Diana Ross and The Supremes. Perhaps, and more importantly, it helped to bridge the gap that had existed between R&B and Pop music bringing them closer together to the benefit of both genres by increasing the appeal of both to a much larger audience. But as yet, this genius bass player was still anonymous as far as the general public was concerned. Finally in 1971 on Marvin Gaye's What's Going On album (yes, that track again) James Jamerson received a credit for his work - "the incomparable James Jamerson," no less - but the sheer magnitude of what he'd achieved took some considerable time to come to light. Even now it's unlikely that we are aware of everything he did. In 1972 Motown moved to Los Angeles and Jamerson duly followed but the Funk Brothers as a unit did not. Personal problems surrounded him, he didn't feel part of the gang and along with his increasing dependence on alcohol his performances began to suffer. So in spite of all his achievements, (and eventual realistic financial retainer) self-doubt had begun to creep in. He was still bitter about his lack of recognition when in 1983 he sadly died from a combination of cirrhosis of the liver, heart failure and pneumonia. 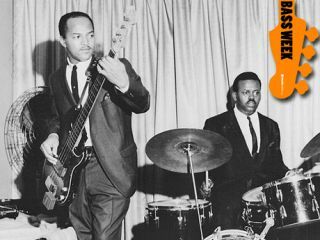 However James Jamerson's legacy lives on and he continues to inspire people to take up bass and his past works serve to make us all play better. There are not many bass players who could or can produce outstanding and memorable bass lines but he was certainly one, and one of the best! This piece is bound to unleash the 'was it Jamerson or was it Carol Kaye' skeleton in the cupboard that concerns certain tracks, but that's unlikely to ever be fully resolved and does little to take away or tarnish the reputation of either player. We salute you both.